As we settle into the swing of 2019, attentions are turned to the home and any improvements that might have made their way onto your list of resolutions for the coming year. With more time to spare, the start of a new year is the perfect time to think about how your kitchen space is working for you and to consider finally embarking on a renovation that will achieve the kitchen of your dreams. With over 40 years of experience, our aim at The Main Company is to create highly individual, bespoke kitchens that are full of personality and unique features that transform everyday routines in the kitchen. Based in an idyllic part of rural North Yorkshire, our kitchens are handcrafted by skilled joiners in our workshop and meticulously fitted into homes across the country. Using the very best in new, salvaged and reclaimed materials, our kitchen designs bring authentic charm and individuality to the modern home. Combining traditional Shaker style cabinetry with on-trend warm copper accents and textured wood, the Rushmere kitchen updates classic influences with a design that perfectly embraces modern lifestyles in the kitchen. 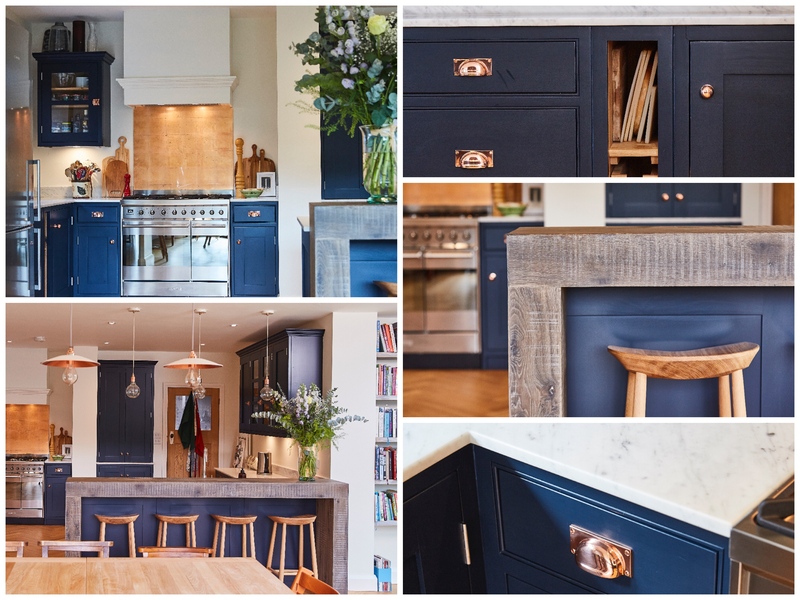 A complete renovation of the space allowed for a contemporary redesign with rich dark blue painted cabinets highlighted by polished copper plate handles and an aged copper mirror splashback. Sleek Carrara Marble is fitted for the worktops and creates a contrast to the hand aged wooden breakfast bar, carefully positioned within the open-plan space to provide the ideal spot for either entertaining or socialising as a family. Check out our Rushmere kitchen in the February 2019 issue of EKBB! Celebrating classic country cabinetry, the Weybridge kitchen project combines the dusky olive tones of Little Greene’s Grey Moss with natural wood shelving and rustic exposed brickwork. Painted cabinets are paired with a subtle quartzite worktop, whilst the statement antique bronze cooker hood introduces luxurious warmth and character to the room. A coordinating display dresser and statement central island complement the main units of the kitchen, providing the option of a sociable breakfast bar and plenty of extra storage space. Set in the old stables of a traditional Yorkshire farmhouse, the Wighill kitchen project is designed to blend seamlessly with the rest of the property, celebrating period features with original beams, restored 300-year-old brick walls and a rustic kitchen full of reclaimed details. The simple, Shaker style cabinetry is painted in Little Greene’s Lamp Black and French Grey with industrial handles and a combination of materials, from stainless steel to engineered oak chosen for the worktops. The Wighill project features a statement breakfast bar with an engineered oak counter perfect for family meals and plenty of storage hidden away inside. Delve into our world with the Journal and discover a closer look at our latest kitchen projects, trends to embrace in the kitchen and the inspirations behind The Main Company lifestyle!